Keeping Up With The Joneses: CF Fundraising Season...Let's Go!! Spring is here which means that our cystic fibrosis fundraising efforts have moved into high gear. Team Bryce Bryce Baby will be participating in the Atlanta Great Strides walk on Saturday May 17th. This is our 6th year walking in this event and we are really excited about it. Fundraising for this event is already underway and I must tell you guys...we have a seriously LONG way to go to reach our fundraising goal of $8000.00. I mean a really LONG way to go. Please consider donating to this cause and/or signing up to walk with us. The leisure 3 mile walk takes place on the Georgia Tech (boo!!) campus. Afterwards lunch is provided for everyone along with some fun entertainment. It's a family event so all ages are welcome! If you would like to donate (yes...please!) or sign up to walk with us (yes, yes, yes!) then click the link below and follow the directions. It is VERY EASY so no excuse non computer savvy people! If I didn't believe in what the CFF does with the donated funds, I wouldn't get behind them every year to raise funds. They really are making "great strides" in the area of CF and they are really making a difference in the lives of all our CFer's. On top of our usual fundraising efforts we are adding a fun event into the mix that I hope everyone will come out to support. 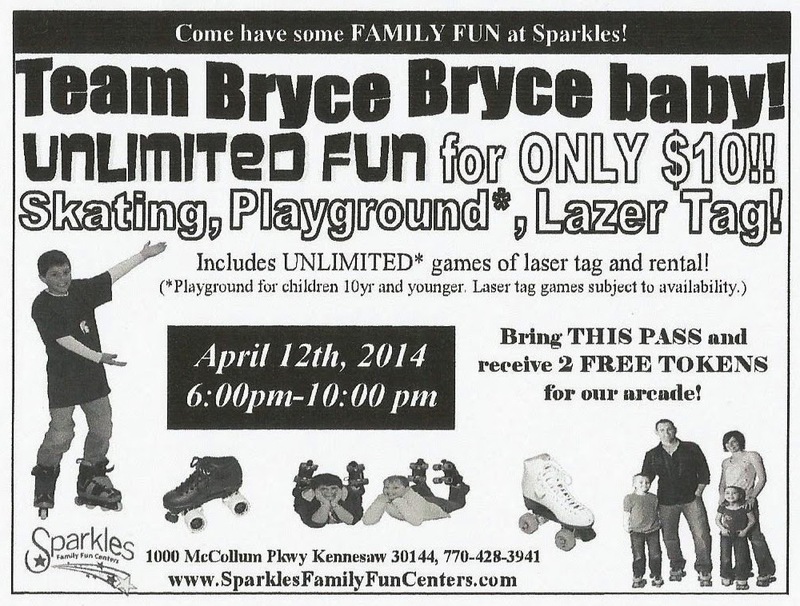 On Saturday April 12th from 6 to 10 pm we are doing a CF Skate Night at Sparkles of Kennesaw. I was hoping to also turn this into a little skating reunion for all my old skating friends so hopefully we will have a bunch of old skaters show up as well. The cost is $10.00 per person which includes unlimited skating, skate rental, unlimited laser tag and unlimited playground time for kids 10 and under. $5.00 from every paid admission will come back to Team Bryce Bryce Baby for the CFF. Again...all funds raised will go to the CFF under Team Bryce Bryce Baby's name. We are grateful to Sparkles of Kennesaw for helping us out with this and we are looking forward to having a lot of fun on April 12th! **Make sure to tell them you are with Team Bryce Bryce Baby...otherwise you will pay quite a bit more! Share this info with everyone! Finally, Bryan kicked off the start of the Davis Elementary fundraiser on Friday with a little help from Bryce himself. Bryan shows the kids an awesome slide show on CF and Bryce does a live demonstration of the vest for the kids, which they all think is so cool. When the kids get back from Spring Break they will start Jar Wars. The kids love this and really get into it. On Monday they bring pennies, Tuesday they bring nickels, Wednesday is dimes, Thursday is quarters and Friday they wrap things up with dollars and checks! The class with the most money raised at the end of the week gets a pizza party. During the week kids can also buy CF awareness bracelets each day and they can buy hat stickers on 2 of the days so they can wear their hat all day at school. Davis has been so supportive of CF and our family from the get go and we are so very thankful! The first group of kids for the day. Bryan did the slide show for every grade level so we spent the entire day at Davis. Bryce did awesome. This slide show is soooo good y'all. I wish he could show it to all schools. All the kids love seeing Bryce on the vest. They ohh and ahh and laugh at how Bryce's voice sounds on the machine. There is also a cute video included in the slide show. It's about 5 minutes if you want to watch. CF friends...if you haven't seen this already please watch. It's great! If nothing else, the accents of the two kids narrating are so cute. I could listen to them all day. So - again, please consider supporting our fundraising efforts this year. There are so many exciting things happening in the CF community. Donations go to research which equal new medications which result in CFer's prolonging their lives! I know it's hard to look at Bryce and think he is sick, but his insides are a mess. What we do on a daily basis is just to maintain his current good health. CF is a very high maintenance disease. We do not get to take a day off from it. CF comes with us every where we go...out to eat, spend-the-nights, school and vacation. Although we have all sorts of new drugs that are helping this community....we are still losing lives far too often. In the last month alone I know of one adult that has had a lung transplant, 2 children under 7 that have passed away and 2 adults under 35 that have passed. I don't want to try and sensationalize the disease for sympathy, but I do stay realistic. CF can gain the upper hand really fast so we must keep up our efforts in finding a cure. I'll get off my soap box now and wait for your donations to pour in. We are so thankful for each and everyone of you that supports Bryce and prays for him. He is a lucky boy to have so many people love and support him. Good luck fundraising! When is Bryce going to start Kalydeco? He turns 6 in July so I'm assuming we will talk Kalydeco then. I was hoping to get him on the pediatric trial but our clinic wasn't participating. :( Not too much longer!